Who could these shields belong to? Dorbina Nikititch is on his way to arrive quite soon, here in Nowhere. Meanwhile I thought I could share a little preview of what's coming next, as an interlude. 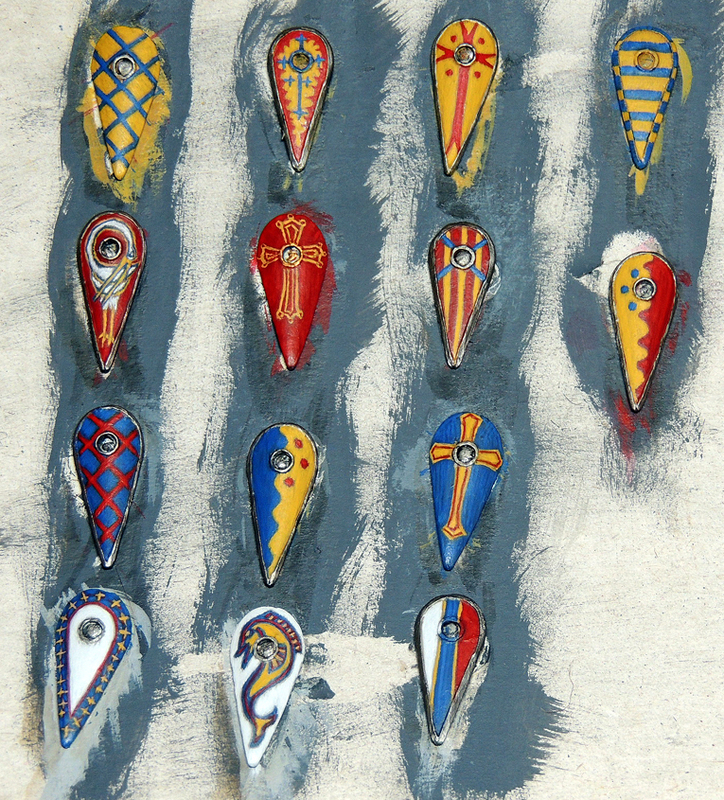 So here we have fourteen freehand painted shields, to be soon glued to the arms of their bearers, knights of renouns and songs. 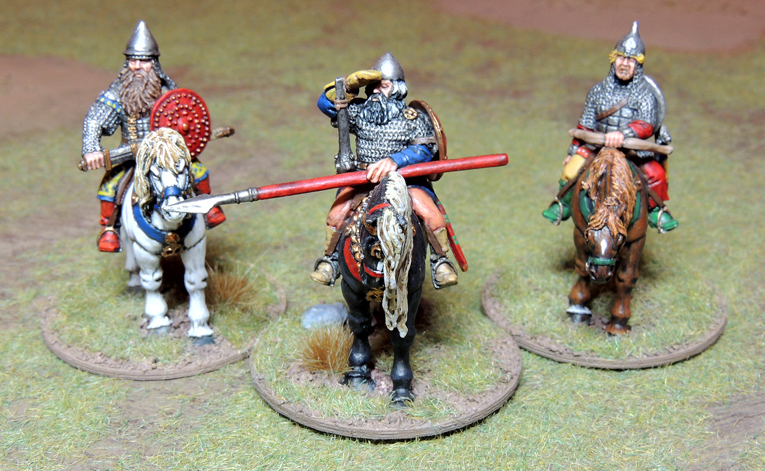 Indeed this is the start of a new SAGA warband (or should I say Ost in this case), which is intended to be played with the Norman or the Frank Capetian battleboard. I shall try both and see what suits the best. Yet, despite the almond shape of those shields, this is not going to be a warband of Normans, nor is it going to be a genuine Capetian army, since it is not meant to represent knights from the area of Paris. 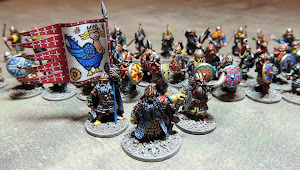 Now, my wargamer friend John did reveal a few days ago what is new SAGA warband will consist of, and of course, since it is designed to face my own, it gives some intelligence of who the hell those shields will belong to. - First: Note that I delibarately avoided to use green color, to leave it to the saracens. - Second: During the last third of the XIth century, these knights would have been seen fighting on battlefields stretching from Spain to Palestine. - Third: Medieval accounts often tell they were rather known for their skills at pillaging and looting than for their fighting spirit. - Fourth: Although assimilited to the Frank dominion, they would speak a different langage at that time. - Fifth: If you know about nowadays french provincial heraldry, one shield clearly points out their area of origin. - Sixth: If you are a usual reader of this blog, I am positive I have already give the answer. Mercenaries perhaps of some sort? And maybe something with the Crusades but can't be sure. They were no mercenaries, but These men formed indeed a significant part of the First Crusade Army. And John gives away clue number four! Well done John! A significant step towards the answer. I forgot to say that the shields are great. I have to admit Nicolas that I did not know your troops would be from this region. It is my favourite part of France. Scratch that, just saw your time frame. Normans. Scratch that again! Wrong answer! Thanks for trying anyway. Salut Sam. Dauphiné? Nice try I must say, cause there is clearly some of it in this fish. But I think at that time Dauphiné was a part of the Roman-Germanic Empire. So not quite close. Thanks for trying! Well Sam, really nice guess, Gascogne or Vasconia, has it would have been called at that time, is definitely a part of the answer, if not THE answer. Vasconian Knights would have for sure be among the ranks of this army. And you have actually spoted that the red shield with the yellow cross, would be the one of the leader of this army. Well the shield is of Toulouse, I remember the last time I was in theToulouse airport seeing a shop for the Toulouse Rugby Club which had the same colours. So I believe you refer to Raymond IV, count of Toulouse, who who fought in both the first crusade and against the moors in Spain. So what are you going to call your warband of infidels, who will most certainly fall to my noble Andalusians. Infidel yourself John! You speak true but your faith is wrong! Well done for Raymond IV de Saint-Gilles. The warband will be called the same as his knights were named in the chronicles of the First Crusade. You'll find out soon enough. it was not easy, but maybe I didn't read enough all the informations! Thank you very much Dean! As someone who is trying his hand at freehanding Saga shields for the first time, all I can say is very well done! These rock!